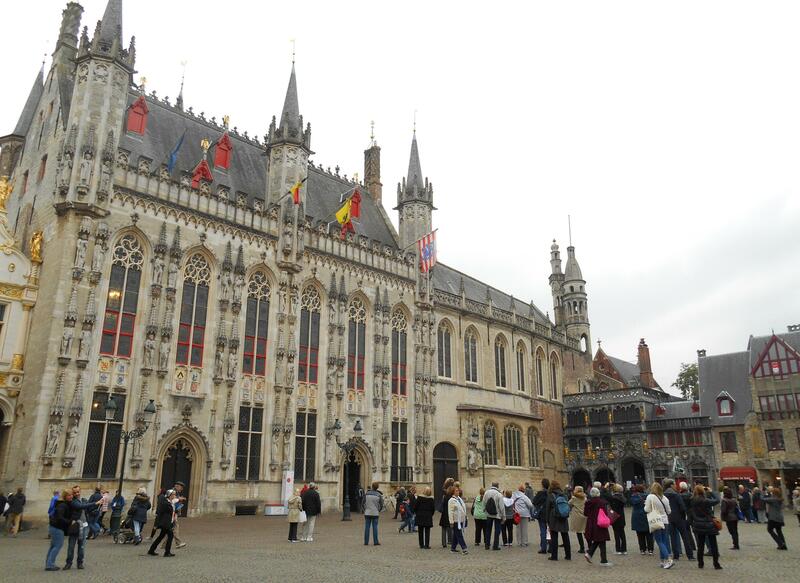 Our last post of call, before the call of the port so to speak, was Brugge. 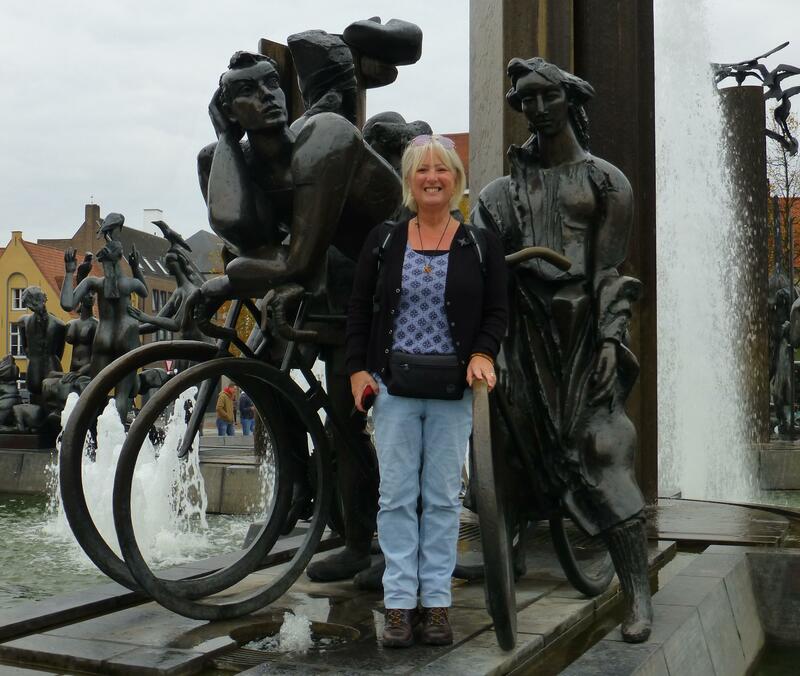 The one sure plan we have always had was a day in Brugge before we caught the ferry home. Quite frankly we were both fairly gobsmacked as to how we managed to arrive with such impeccable timing. 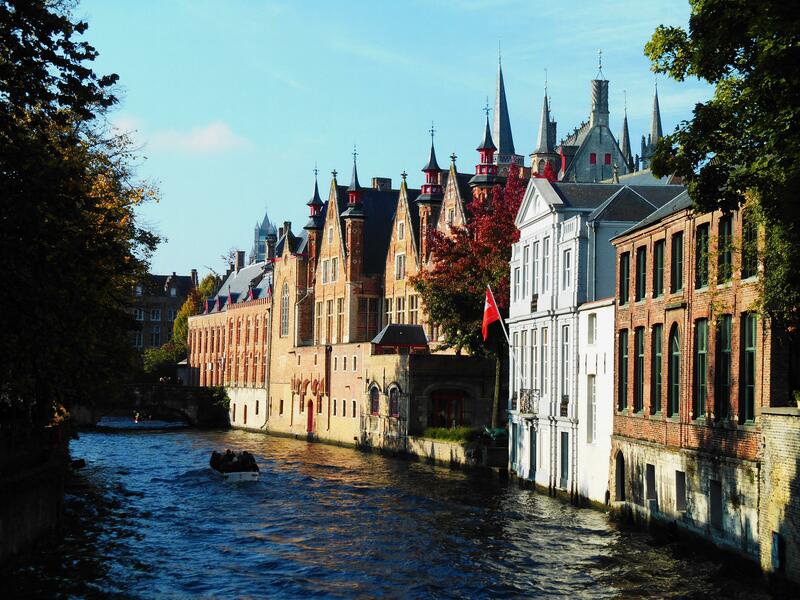 Brugge is said to be one of the world’s first tourist destinations, having set up a Tourist Information as far back as 1909, they have certainly had time to work out what the tourist wants and they have it with abundance – medieval architecture, lace and chocolate are everywhere. We find it hard to believe anyone leaves the city without purchasing chocolate, you need a steel brace to avert your eyes from the mouth watering displays. 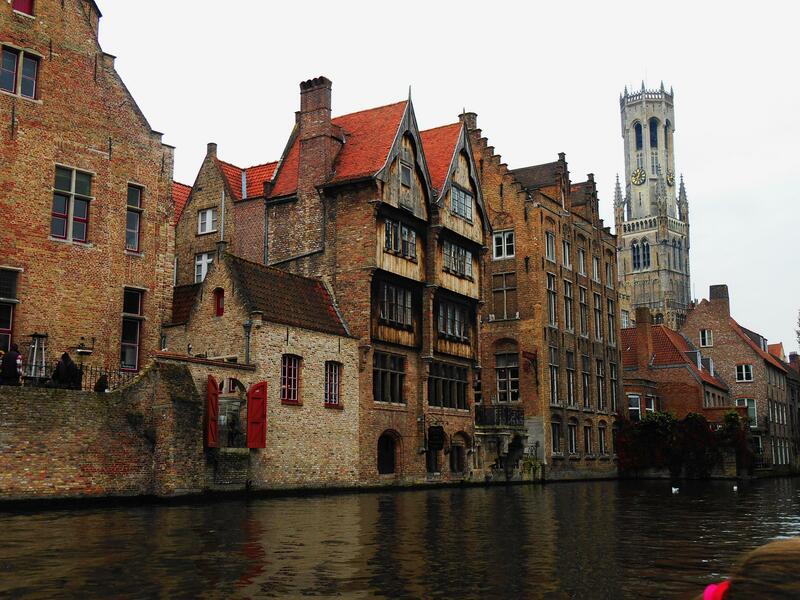 By luck or whatever Brugge remained relatively unscathed during the war and retains most of it’s medieval architecture. We struck lucky and both the Church of our Lady and St. Salvator’s Cathedral had their scaffolding removed recently, on the downside the insides of both buildings are being restored so we missed seeing the interiors. It was be churlish to complain though when instead we visited the Burg Square, the Markt and several other areas containing some of the most sensational buildings we have seen anywhere. We popped in Sunday for a couple of hours and decided to go back for a full day Monday thinking it would be quieter. Not a bit, possibly busier on Monday – we stayed on the town aire next to the coach drop off and pick up, hundreds of buses in and out all day with at least half of them British and the other half school children. Despite Brugge giving the impression of a a tranquil place to visit it really isn’t. The sheer numbers of tourist, the horses and carts clattering around the cobbles and the carillon of 48 bells, added to the bells of several other churches, meant at times it was difficult to hear yourself speak. Surely though one of the highlights of Brugge is when the carillon in the Belfry of Brugge strikes up a ringing rendition of “It’s a long way to Tipperary” on the hour, every hour – truly amazing. 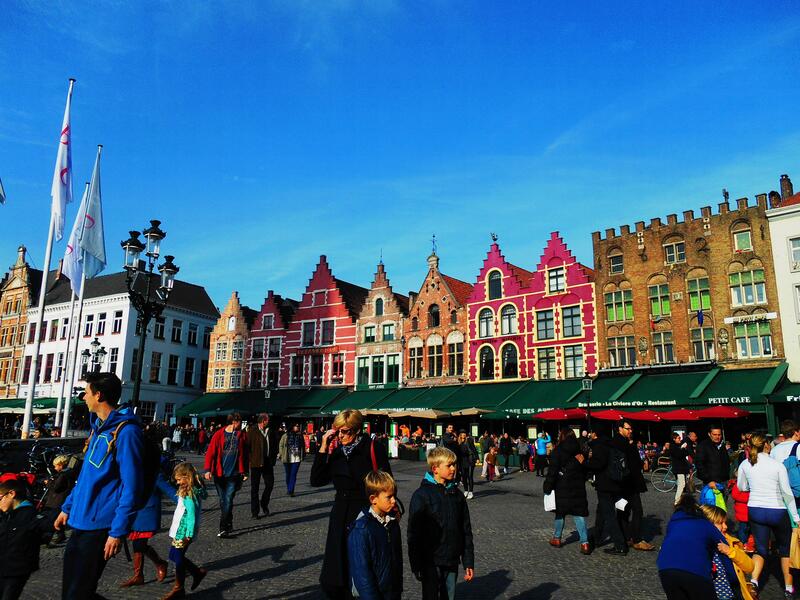 When in Rome….so obviously when in Brugge chocolate is mandatory. I never thought it would be possible to say this but, there are too many chocolate shops. It is mind blowing, hundreds and hundreds of them on every street. I needed to shop for chocolate so left Iain to his own devices for a couple of hours whilst I perused. I then came to realise the benefits of so many shops – everyone I actually went in offered me a sample chocolate! On a roll I visited eight shops before purchasing :), now slightly sick of the taste of Belgian chocolate. 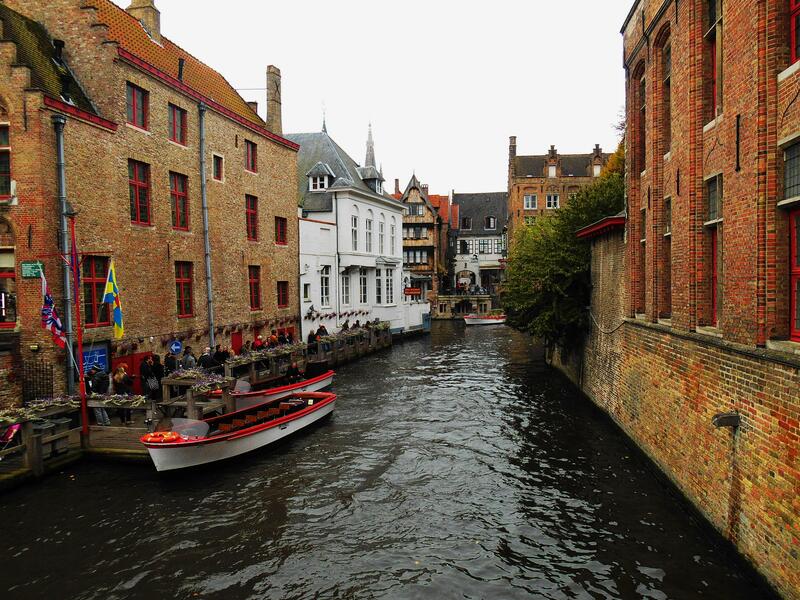 Aside from chocolate we wanted to visit Brugge to see the canals. I am going to have to say it didn’t come across as the ‘Venice of the North’ to us, a fair few canals but mainly small with lots of dead-ends. That isn’t too take away from the charm of the canals and their setting alongside 17th century warehouses and homes, it stands on it’s own merits without needing a Venice type canal label. 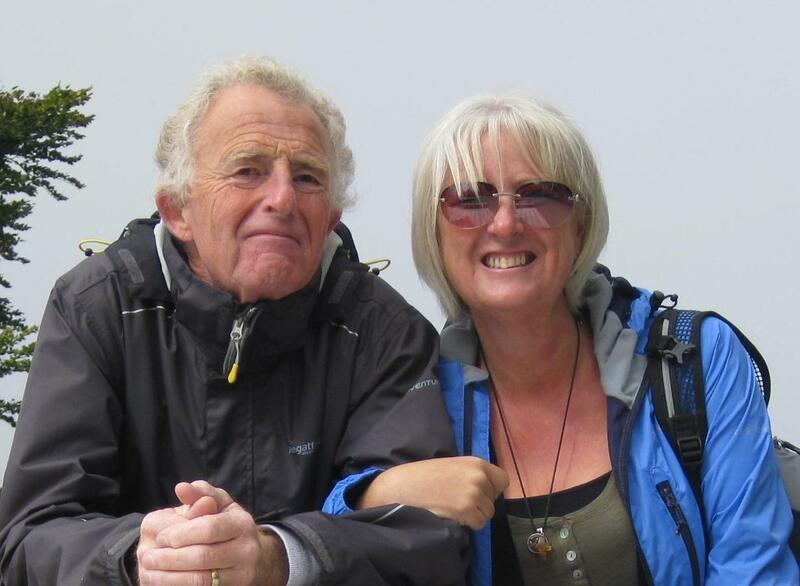 We of course took the obligatory canal boat trip, forget sedate and flowing – think more pack ’em in and speed ’em round. Due to the low bridges there are just one type of boat and they fair nip around causing a few wakes as they go. There endeth the Grand Depart tour around Europe for us, Zeebrugge tonight and ferry home tomorrow. We have had the absolute time of our lives, we have seen and done more than we thought possible – it has been everything we hoped it would be and so much more. In summary :31 border crossings, 20 countries, 19,000 miles, (passports checked just twice). 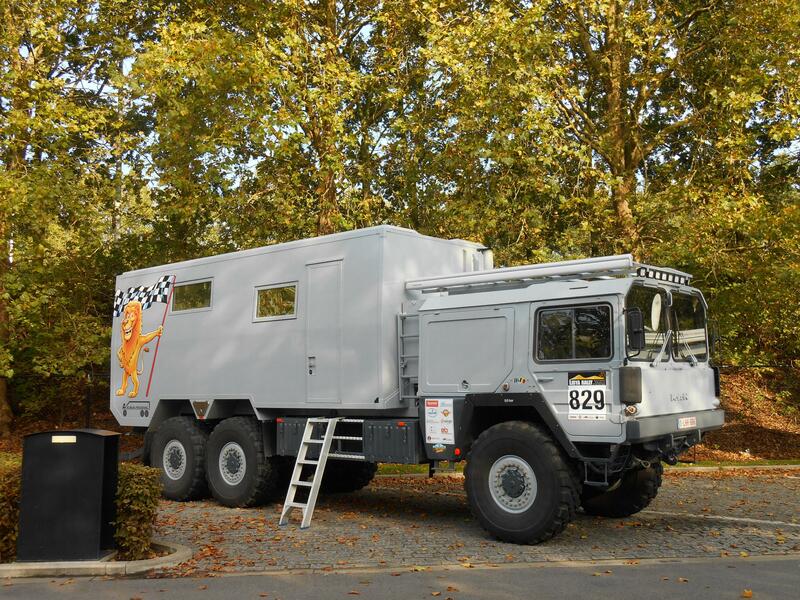 We are well under our budget, amazingly, but sure we will see a lot of that go with the 25 essential maintenance jobs on the list required for the van (thank the Lord for gaffer tape its all that’s holding us together right now). There have been a few navigational related skirmishes, but trying to get us around Europe on a 1:3 200 000 atlas was always asking for a few headaches! We would do it all again without a moments thought – well we did think we might like one of these to go with, but guess our van will have to do. The first question is always where we did like best? We didn’t, honestly, every country we visited we found amazing sights, lovely people and had fun. Whenever anyone asked that questions during the trip it was always the country we had just left. Every day was an experience, things we had only read about previously were seen in the flesh : visiting Meteora, driving Trollstigen, flying in an Airship, crossing Millau Bridge, walking into Russia (ok only two steps but we did it). Others were stark reminders of how lucky we are: the ferry fire on the Norman Atlantic, Auschwitz, the WWI and WWII battle-grounds and the military cemetery. Our lack of real planning and direction paid off more than we could have hoped mainly because Europe is stuffed full of incredible things to see – you would struggle to miss them – luckily for us! In the words of the that famous 20th century commentator “That’s all folks”.